Some people have cynically defined nostalgia as a type of self-delusion. After all, they say, what exactly was good about the Good Old Days? Times were tougher, money scarcer and luxuries fewer. I remember a book published in the early 1970s titled The Good Old Days -- They Were Terrible! The author claimed the Good Old Days were good only for a privileged few and were "unrelentingly hard for most." I would wholeheartedly agree with the last half of that assertion, but I would take umbrage with the first half. It seems to me that how we deal with adversity writes the story of whether our days were good or bad. The Good Old Days certainly were not easy. Ask anyone who lived through times of economic uncertainty and war. Oh -- wait a minute! That could be talking about today. You don't need memories of living through the Great Depression and two world wars, of reading by kerosene lantern or of taking the well-worn path to the little house out back in order to remember the Good Old Days. You merely need the heart of a child who can have more fun turning a box into a playhouse than playing with anything the box might contain. Even children who grew up in the 1970s remember those days of wide-eyed wonder. 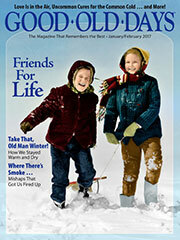 This is my last column in our yearlong look at the 50-year journey of this magazine that "remembers the best." With our golden anniversary, Good Old Days is rededicated to the memories of all those children of every decade -- of every generation -- who look back to their childhood with bittersweet nostalgia. Those days may have been tough, but they were what made us who we are. That's what made them the Good Old Days.